Ms. Zanolli is an HNN intern. In 1908 a muckracking reporter by the name of Ray Stannard Baker published Following the Color Line, in which he exposed what would later be called “sundown towns”: communities that forcibly kept out African-Americans. 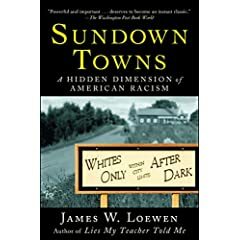 Discussion of the practices of these communities remained virtually non-existent for almost one hundred years, until Sociology Professor James Loewen published Sundown Towns: A Hidden Dimension of American Racism in 2005. In this revelatory exposé, Loewen methodically details the past (and perhaps present) existence of sundown towns throughout the Northern United States in the twentieth century. He defines a sundown town as “any organized jurisdiction that for decades kept African-Americans or other groups from living in it and was thus 'all-white' on purpose.” The methods of the sundown town went beyond the usual racist practices common to many communities an often included the posting of explicit signs. In Sundown Towns, Loewen pieces together massive amounts of census data and numerous oral histories to create a coherent story of localized, systemic racism that would shock most Americans. That is, of course, if they read it. In print since October of 2005, Sundown Towns has sold a paltry 12,000 copies in hardcover and lies just under number 15,000 on the paperback sales rankings of Amazon.com. Except for the Washington Post, which declared that the work “deserved to become an instant classic,” the mainstream media largely ignored the book. The New York Times, the most prominent newspaper in the Eastern media establishment, neither reviewed the book nor published a news story about the issues it raises. The Times also never reviewed Lies My Teacher Told Me, Loewen’s most famous work and one of the all-time best-selling books by a sociologist. Several contacts in both the news and book departments of the Times all declined to comment on the subject to HNN. Loewen, however, did venture a guess as to why the Times reviewed neither Lies nor Sundown Towns: he thinks the book editor, Sam Tanenhaus, equates Loewen with Howard Zinn, the controversial leftwing historian. If that is the case, then the lack of media attention might be explained by the simple fact that the media prints what people want to read. Weeks, who also published a short article questioning the current level of inclusivity of Highland Park, Texas, alongside his review of Loewen’s book, supports Hunt’s conclusion. He says, “Many whites—liberals and conservatives—are tired of longstanding, historical grievances against them.” At first glance, Loewen’s book and Week’s story might appear to be just another barb at the “white guilt” that is shared among many Americans, who remain extremely sensitive to matters of race. 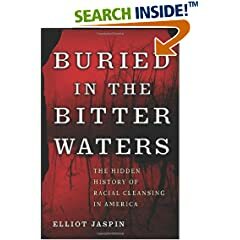 Judging by the experience of Elliot Jaspin, author of Buried in the Bitter Waters, a newly released book about racial cleansings in the South, it seems that some members of the publishing world take care to avoid exacerbating “white guilt”. Jaspin’s book, excerpted on HNN, is an extended version of his 2005 Cox newspaper series entitled “Leave or Die.” Using years of research and computer-assisted reporting, “Leave or Die” exposes what Jaspin calls “America’s family secret”: formal and informal racial cleansings that occurred in the South beginning in 1864 and continuing for about sixty years. Jaspin, a long-time employee of the Washington bureau of Cox Newspapers, claims the editors of the Atlanta-Journal Constitution, a Cox affiliate, edited the series to appease white subscribers. Initially, the editors of the Constitution refused to run “Leave or Die,” claiming that similar issues had already been covered by the paper. In his book, Jaspin explains their resistance with a quote from his Washington editor, Andy Alexander: “I think we know what’s going on here…they are afraid of angering white people.” Under pressure from Jaspin, Loewen, and others, the editors of the Constitution eventually agreed to run an edited version of the series. After it ran, Jaspin said he was professionally punished for his provocative research. He was immediately demoted to reporter and suffered a pay cut, as well as criticism and disapproval from his employers and colleagues. For those interested in learning more about sundown towns, consult Loewen’s website at www.uvm.edu/~jloewen. The site offers tools to determine if your town is or was a sundown town. Loewen also offers a monthly “sundown town email”; to sign up, contact him at jloewen@uvm.edu. Additionally, Maggie Potapchuk’s website, http://mpassociates.us, offers an Inclusive Community Tool, among other useful texts on racism. It seems to me that Professor Loewen has been sigularly fortunate in his writing career. LIES MY TEACHER TOLD ME was given far more credence that it deserved. The chapter on pre-Columbian explorations of America is a monument to either credulity or to political correctness. I suspect that SUNDOWN TOWNS is a far better book but if it is being ignored perhaps it is a case of the karmic balance being restored. There's nothing prohibiting people interested in buying this book from purchasing it if they want to. If publishers thought it would sell, they'd put more muscle behind it. Clearly, they've decided it's weak. So what is Loewen doing now? Trying to exert pressure on publishers to force them to distribute and advetize it more? PLease.